An Equity Profile of the Los Angeles Region highlights the widening inequities in income, wealth, health, and opportunity in Los Angeles County. The report was developed by PolicyLink and the Program for Environmental and Regional Equity (PERE) at USC, and is supported by the Weingart Foundation. While the nation is projected to become a people-of-color majority by the year 2044, Los Angeles reached that milestone in the 1980s. Los Angeles’ diversity is a major asset in the global economy, but inequities and disparities are holding the region back. The report underscores how closing racial gaps in economic opportunity and outcomes will be key to the region’s future. 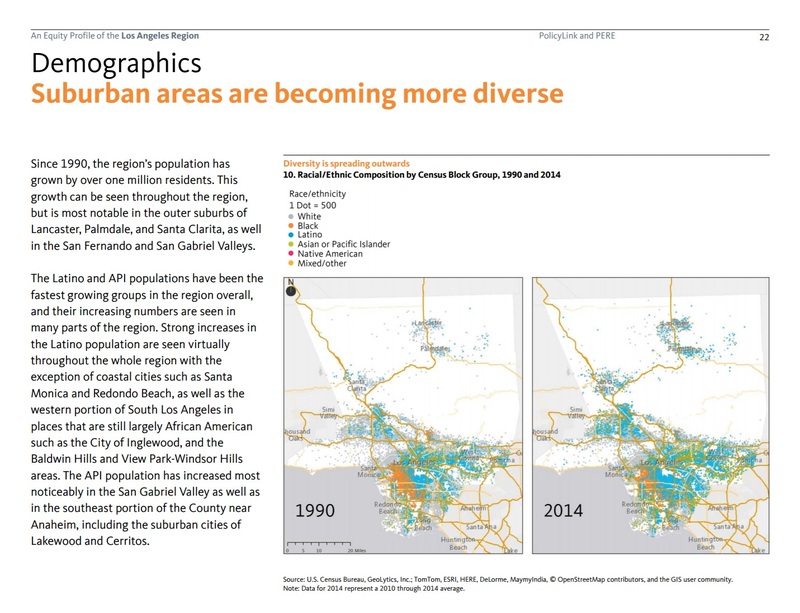 The 2017 Equity Profile of the Los Angeles Region is the first in a series of reports of the Southern California Regional Equity Atlas—a joint project of PolicyLink and PERE that will result in the publication of equity reports and analysis on an annual basis. The Southern California Region Equity Atlas will provide an ongoing resource for a variety of stakeholders and policy makers to help guide collective strategy, support advocacy and measure progress in addressing these issues. The 2017 Equity Profile of the Los Angeles Region summary was released at the Weingart Foundation's “Achieving Equity” convening in Los Angeles on March 2nd, 2017. Since 1979 the highest-paid workers have seen their wages increase by 13 percent while wages for the lowest-paid workers have declined by 25 percent. Los Angeles County’s economy was hit hard by the downtown of the early 1990s and job growth and economic output have lagged behind the national average since then. Since 1990, poverty and working poverty rates in the region have been consistently higher than the national averages. While the pursuit of education has increased for all youth, youth of color are still far less likely to finish high school than their white counterparts. If racial gaps in income and employment were closed, the LA economy would be nearly $380 billion stronger. To build a more equitable region, leaders in the private, public, nonprofit, and philanthropic sectors must commit to putting all residents on the path to economic security through equity-focused strategies and policies that grow good jobs, build capabilities, remove barriers, and expand opportunities for the people and places being left behind.